Sicily's Mount Etna volcano unleashed an explosion Thursday, hurling molten rocks and steam that rained down on tourists, journalists and a scientist who scrambled to escape the barrage. Ten people were reported injured. 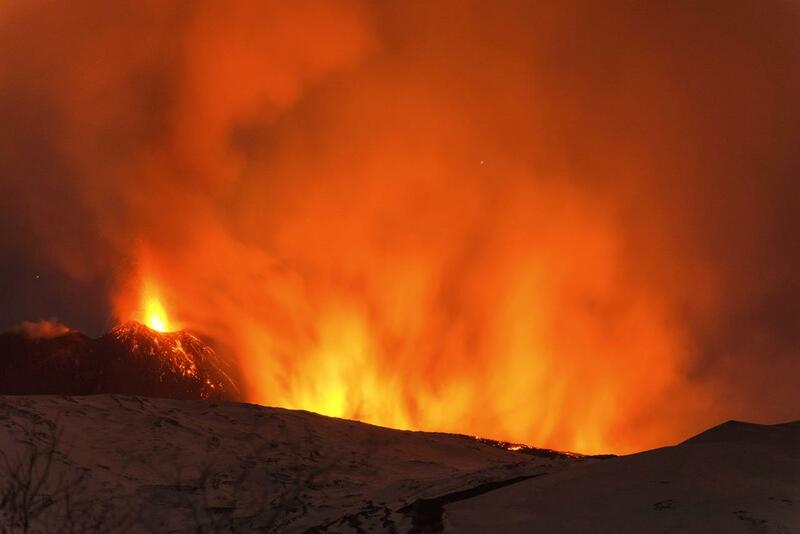 The tourists, who were drawn to Etna to observe the spectacle of the active volcano erupting, were caught by surprise when its flowing magma hit thick snow, causing a phreatic explosion that rained rock and other material down upon them. A BBC journalist and camerawoman on assignment at the volcano were among the injured. Their film shows an explosion of steam followed by a second explosion of boiling rocks and people running away from the explosion. The clip continues in a snowcat, where a man holds a paper towel to stanch the bleeding from his head and hugs his wife. 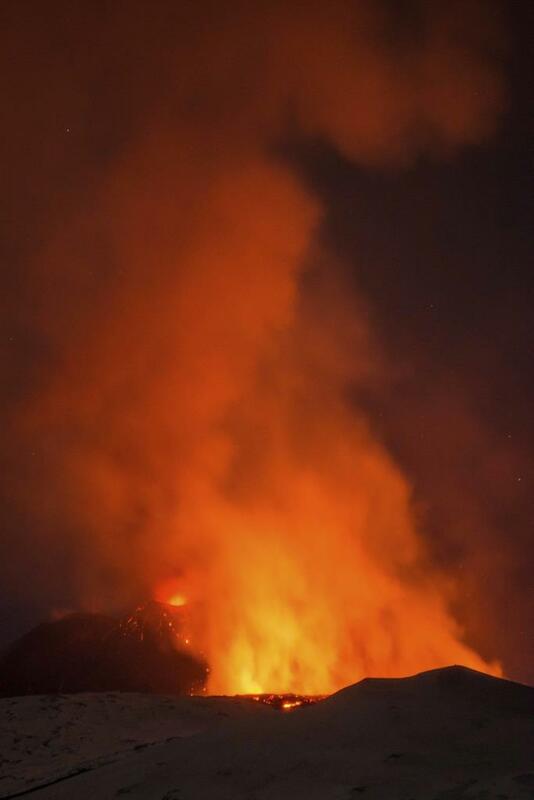 Authorities say about 35 tourists were on the volcano when the explosion occurred around midday, and that the guides who accompanied them helped bring them to safety. The president of the Italian Alpine Club chapter in Catania, Umberto Marino, said he was traveling up the volcano in a snowcat when injured people started running in his direction. "The material thrown into the air fell back down, striking the heads and bodies of people who were closest," Marino was quoted by the Catania Today website as saying. According to Italian news agency ANSA, four people including three German tourists were hospitalized, mostly with head injuries. None of the injuries was listed as grave. Italy's volcanology institute said the explosion took place at about 2,700 meters (8,858 feet) above sea level, putting the tourists at more than 500 meters (1,640 feet) below the base of the newest southeast Mount Etna crater where the lava flow originated. Among those present when the explosion occurred was a scientist from Italy's volcanology institute, Boris Behncke, who said on his Facebook page that he had suffered a bruise to his head. "I am generally fine and having a good, well-deserved beer in this moment," he added. 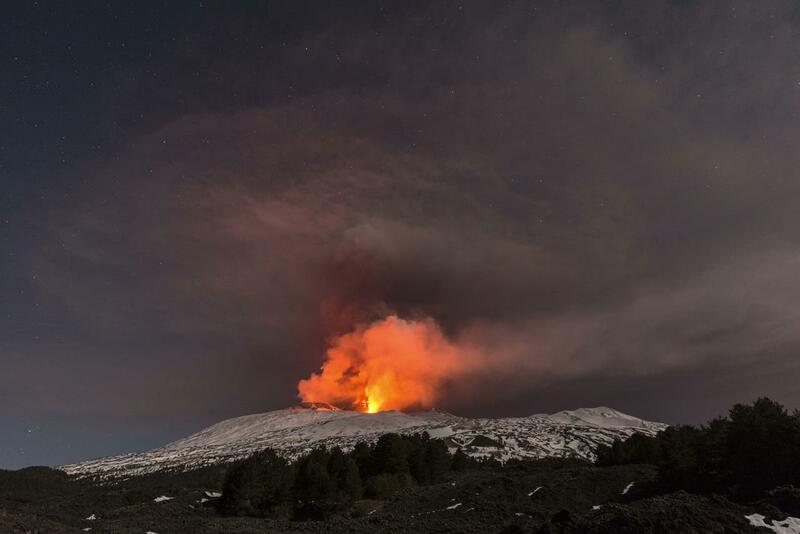 The BBC's global science reporter, Rebecca Morelle, was on assignment on Etna and described the experience in a series of tweets. "Running down a mountain pelted by rocks, dodging burning boulders and boiling steam — not an experience I ever ever want to repeat," Morelle wrote. The BBC crew was shaken but physically OK despite having suffered cuts, bruises and burns, she wrote. Morelle later showed the camerawoman's jacket on the air with a big hole in the back where the material had melted in the explosion. Morelle said the explosion was "a reminder of how dangerous (and) unpredictable volcanoes can be." 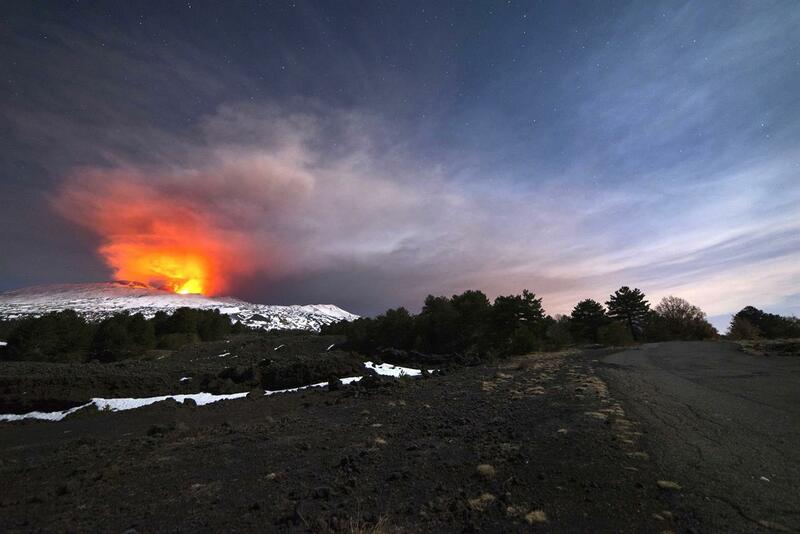 Mount Etna has been active for the past two days, creating a visual spectacle as it spews lava and ash into the air. A new lava flow started from the southeastern crater on Wednesday, and was advancing with a temperature above 1,000 degrees Centigrade (1,832 degrees Fahrenheit) in an area covered by snow, creating the explosion. Officials at nearby Catania airport announced Thursday they would reduce arrivals by half to five flights an hour due to Mount Etna's ash clouds. Departures were continuing as scheduled. Thousands of tourists each year visit Etna, one of the world's most active volcanoes located on the eastern coast of Sicily. Eruptions occur frequently, although incidents that involve injured tourists are rare. A similar phreatic explosion, caused when lava hits water, on Etna in 2002 injured 32 people, mostly firefighters and other emergency workers responding to a series of eruptions. Authorities limited access to riskier areas on Mount Etna following a deadly eruption in 1979 that killed nine tourists who were standing at the volcano's rim. Reports indicate that the tourists who experienced the eruption Thursday were in a zone where access is permitted with a guide. The volcanology institute said it was continuing to monitor the situation.